For the month of October, the Lakeland real estate market of short sales and bank-owned (REO) properties market share decreased to 60% from the previous month, reasoning the recent foreclosure moratorium. 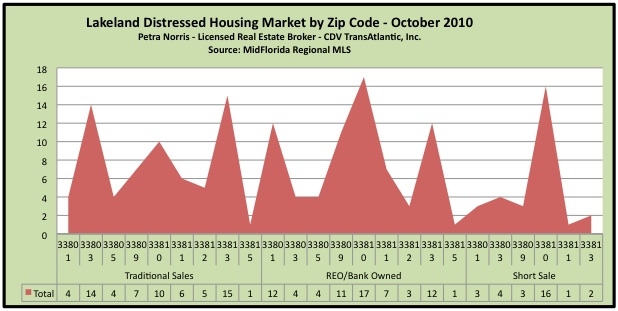 There were a total of 100 distressed homes sold, compared to 130 in September and 92 distressed Lakeland homes sold the year prior, according to Mid-Florida Regional MLS. Currently there are a total of 1882 Lakeland FL homes for sale and 462 homes under contract (11/27/2010). By calculating total inventory, homes that are under contract which are included in my inventory share because these properties have not closed in which a buyer could walk away at any given time. Average days to Closing for other distressed properties are 208 days. 71 Lakeland FL Foreclosures (REO) sold – average sold price $75,753 – median sold price $71,990. 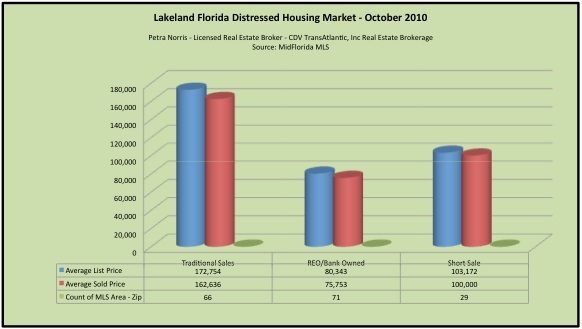 You can see from the graph below, zip code 33810 had the most distressed sales (foreclosures and short sales) in Lakeland, FL.